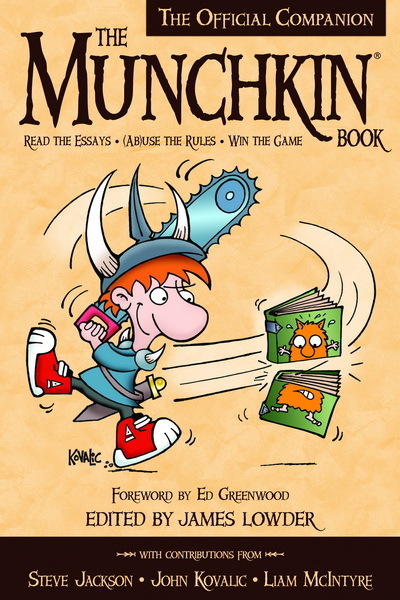 Daily Illuminator: Pre-Order The Munchkin Book Today! 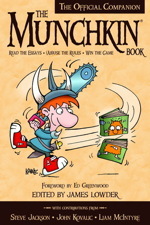 January 29, 2016: Pre-Order The Munchkin Book Today! The Munchkin Book, a collection of essays about your favorite game, is coming in February from our partners at BenBella, and the book is now available for pre-order at Amazon. Edited by James Lowder, this book includes exclusive game rules, original artwork by John Kovalic, and Munchkin secrets from Steve and Andrew. The book has been years in the making -- we officially announced the project back in 2013 -- and it's only through the hard work of James, Miranda, and the BenBella staff that we're getting our hands on the finished work next month. This book is for every Munchkin fan who has ever wanted to know more about what happens behind the-scenes, and everyone who enjoys collections of essays about games as much as I do. (Please don't judge me by my collection of books.) The Munchkin Book is one of those titles I've personally wanted for years now; please ignore the rumors that I happily encouraged Steve, Andrew, James, and Miranda to wrap this up only so that I could read the finished book. Now to convince someone to start work on a solitaire adventure Munchkin book . . .